Two out of two: Cyborg has perfect Octagon record. Cris Cyborg is among the baddest women on the planet. An explosive knockout artist, the Brazilian has torn through practically every opponent put in front of her with 15 of her 17 MMA victories coming by stoppage. Indeed, she is unbeaten in nearly a decade of bouts and has amassed a belt collection equally impressive with Strikeforce and Invicta FC featherweight straps gathered. But one piece of gold has remained allusive. The UFC has long been held up as the premier promotion and despite her impressive record and star appeal, Cyborg has found herself on the outside looking in. Offering just two weight classes, strawweight (115lbs) and bantamweight (135lbs), the 31-year-old has been forced to watch on as the likes of Ronda Rousey elevate women’s MMA to a new level of mainstream success. Cyborg’s hulking frame means the cut down from 145lbs to 135lbs is dangerous and damaging, forcing her to take her devastating brand of MMA to Invicta, an all female MMA promotion back in 2013. Predictably, she dominated, winning the featherweight title in just her second fight before going on to successfully defend the belt three times. In her five Invicta fights she knocked out all but one of her opponents in the first round and the need for a bigger stage was obvious. Last year saw that come to fruition as Cyborg made her long-awaited UFC debut. At a catchweight of 140lbs, she delighted a fervent hometown support by dispatching the well-respected Leslie Smith in Curitiba with a first-round stoppage. And her next bout was just as impressive, Lina Lansberg becoming Cyborg’s second UFC victim in a savage performance which culminated in a second-round finish. But she was still without a permanent home, stuck between outgrowing Invicta and catchweight UFC bouts from a small pool of willing opponents. Then belated change arrived. Late last year the UFC opened up a 145lbs division, yet the inaugural title fight was between Holly Holm and Germaine de Randamie. Recovering from the brutal weight cuts of her catchweight bouts and the complex nature of a failed drugs test appeal, the UFC proceeded to open up the division without her and at UFC 208 De Randamie made history, albeit in controversial circumstances after two separate late hits after the bell, to become the UFC’s first 145lbs champ. In the aftermath, a tidal wave of criticism toward the Dutch woman led to calls for a rematch but Cyborg is, of course, doing her best to stem the flow. Having vacated her Invicta featherweight title earlier this year, Cyborg has her eyes fixed squarely on De Randamie and UFC gold. And with the division in a mess, it needs her more than ever to legitimise it. The former Strikeforce champ is adamant she is next in line but unlike other title contenders before her, she is happy to step back into the Octagon before getting a shot. “They guaranteed that whoever wins the belt is going to fight me so Germaine will be my next opponent,” she said. “I don’t know if it will be soon or not because she has a hand injury but if she’ll be ready I’m ready. “You know I’m training, I’m not in a rush for the belt. I think it’s God’s plan if I’m going to fight soon and I really don’t care about the belt, I already know I’m a world champion. It doesn’t matter if I’m holding a belt. I really want to fight for it because it belongs to me but let’s wait and see what’s going to happen. I want to fight soon, though, I don’t want to sit down and wait for this fight. I don’t want to wait to fight for the belt, I want to fight. 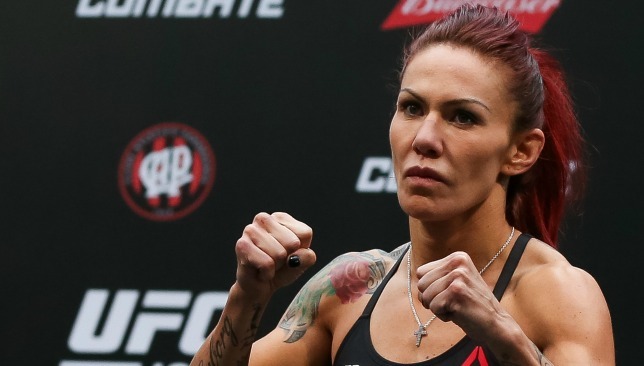 Accusations of doping have followed Cyborg throughout her career but as one of the most tested UFC athletes by USADA, she remained clean until being notified of a failed out of competition drug test in December. One week after De Randamie won the belt, though, USADA cleared Cyborg of the accusations. Her use of spironolactone, a diuretic which can appear to mask steroid use, was prescribed to her by her physician to treat an endocrine disorder. Now, she can refocus on her goal of becoming world champion. With no fight currently booked, Cyborg joked about challenging Rousey in a WWE tag team match alongside pro wrestling star Gabi Castrovinci, since she feels that she and Ronda won’t be sharing an MMA cage anytime soon. For years a superfight between Cyborg and Rousey has been discussed as the pair headed up the pound-for-pound discussion but after the former’s back-to-back defeats, which slid her further towards retirement, it’s a bout which looks nothing more than fantasy. However, a post recently emerged which had MMA fans in disarray when strength coach and nutrition specialist Dan Garber, welcomed Rousey to his team, saying: “Excited to have her on board and to accomplish some great things with her this year”. Will we see her back in the Octagon? “You know I think Ronda Rousey did a lot of things for women’s MMA,” Cyborg said. On Episode 1 of UFC 210 Embedded, light heavyweight title challenger Anthony “Rumble” Johnson runs outdoors in Florida and escorts another Rumble to a dog park. Light heavyweight champion Daniel Cormier balances resistance and recovery in a swimming pool before lugging snacks to his daughter’s softball game. Middleweight contender Gegard Mousasi trains in Holland while his opponent, former champion Chris Weidman, endures April Fool’s Day. 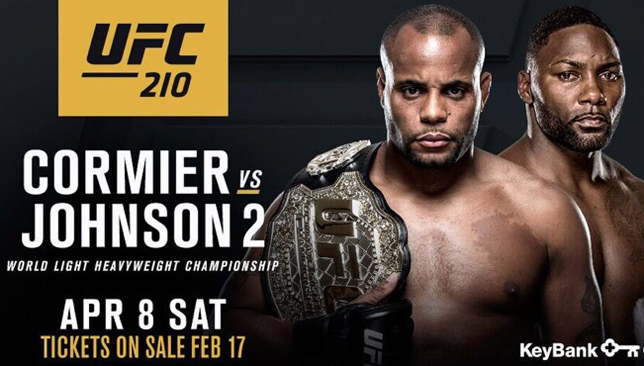 Who do you think will win between Cormier and Thompson? 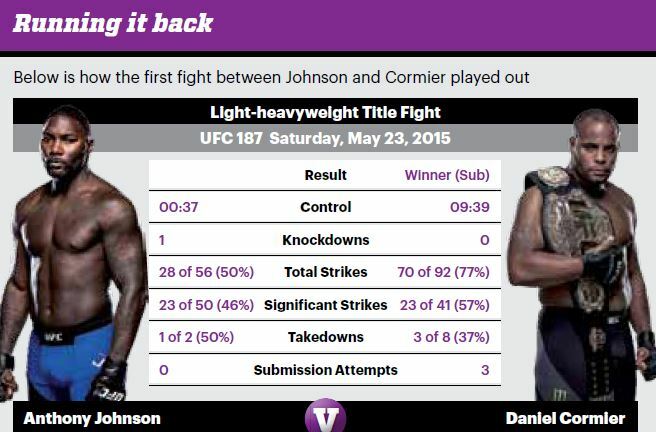 UFC returns to New York as Daniel Cormier (18-1-0) faces Anthony Johnson (22-5-0) in what should be an explosive light heavyweight title re-match. 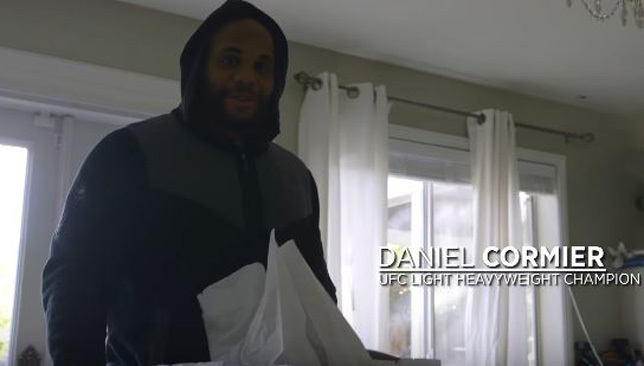 Cormier won their first bout at UFC 187 via third round submission. Here’s everything you need to know ahead of this much-anticipated fight. WHERE IS THE FIGHT ON? WHAT TIME WILL THE MAIN CARD START? WHO IS FIGHTING ON THE MAIN CARD?